I would like to take this time to thank the good state of North Carolina for taking such good care of handicapped folks. I have had relatives that have been so negatively affected by restaurants and other establishments not having the right types of access that my heart breaks for the handicapped. While traveling through North Carolina recently I snapped this picture at a local gas station. My only issue would be that if the handicapped folks didn't have a properly functioning horn in their vehicle I wonder what would happen? 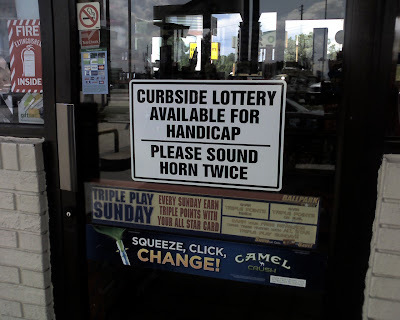 Darn those North Carolinian congressmen that have deprived the horn-less handicapped of their inalienable right to purchase a lottery ticket. Next Friday or THE Next Friday? WOW -- What a RIDE this has been! !